The MIT Energy Club is one of the largest student-run organizations at MIT, with over 5,000 members. Their mission is to bring students, professionals, and policymakers together for fact-based analyses of the most pressing challenges in energy. They have regular events with guest talks, company tours, and the Friday Muddy Megawatt happy hour. They also host a number of professional flagship events each year, including the annual Energy Conference, Energy Night, and Energy Hackathon. As the largest student-led energy conference in the U.S., the Energy Conference has become a premier event to connect professionals, policymakers, academics, and students in the energy industry. 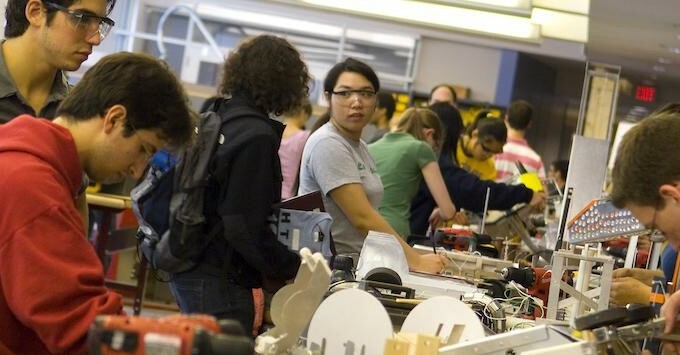 Hosted annually at the MIT Museum and organized entirely by students. Energy Night is a celebration of the ingenuity, innovation, and imagination of MIT faculty, researchers, students, and alumni. For students, the Energy Hackathon is a helpful platform to learn real-world challenges, generate ideas, find startup partners, and win cash awards. For companies, it acts as a powerful crowdsourcing platform that generates a breadth of potential solutions for their challenge.